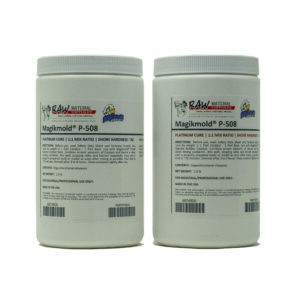 Magikmold® P-540T is a platinum-cured, room temperature curing (RTV), translucent silicone rubber designed for the manufacture of high-performing, flexible molds. Available in 4 kit size options. 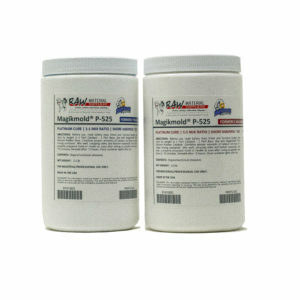 Magikmold® P-540T is a platinum-cured, room temperature curing (RTV), translucent silicone rubber designed for the manufacture of high-performing, flexible molds. This two-part (Catalyst & Base), liquid silicone rubber has a Shore Hardness of A40, a pour time of 90 minutes, and a demold time of 24 hours. 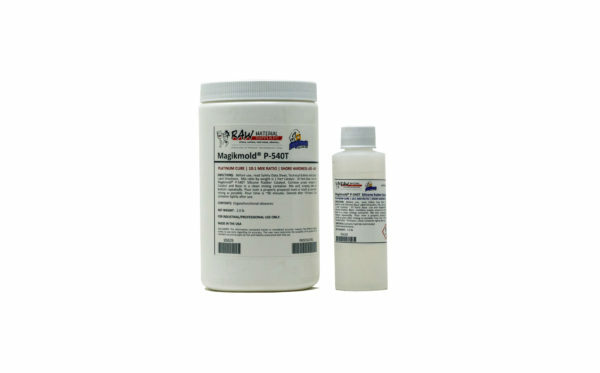 Release agent is not necessary for casting most materials into Magikmold® P-500 Series molds, but for longer mold life with epoxy, polyurethane or polyester resins, a barrier coat or release agent (e.g., Stoner E-236 Urethane Mold Release) is recommended. This is a pourable rubber, but it can be easily thickened with silicone thickener for brush-on application. Demold Time @ 77°F 24 hr. CURE INHIBITION: Contamination from amines, sulfur, tin compounds, polyester resins, some paints and some silicone rubbers may inhibit surface cure of this product. Perform a test cure on an identical surface to determine that complete curing and good release are obtained. READ SAFETY DATA SHEET BEFORE USE. READ TECHNICAL BULLETIN FOR FULL PRODUCT INSTRUCTIONS. obtain the optimum physical properties from the cured rubber. Mix thoroughly, scraping sides and bottom of the container. To ensure a bubble-free mold, it may be necessary to deaerate the liquid rubber under vacuum at 28-29 inches mercury. Pour the rubber as soon as possible after mixing/vacuuming. At room temperature (~73°F), this rubber cures to full hardness in the specified demold time. At higher temperatures, they cure faster. At lower temperatures, more time may be needed to reach full hardness.